Still magnificent even in decay, Do'Krin Temple is the crowning architectural achievement of the reign of Darloc Brae, the Golden Beast of Anequina. It was built with the loot of the Anequine Conquests, when Darloc Brae ruled from Rimmen to Arenthia. The Do'Krin Monastery is located in western Reaper's March, northwest of the Grahtwood tunnel. It was constructed in Anequinan-stone style to endure and to protect the Golden Claw, a holy artifact of great power from the time of the Mane Tullar-dra. The Order of the Claw was created by the Lunar Clergy to guard the Monastery and its main relic and therefore, its member are trained in the Monastery in martial arts. A bridge east of the holy site connects it with the roads of the March. The many waterways and falls in the area are believed to be moon-blessed by the Order, a blessing which keeps the Claw safe from any danger. 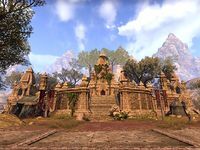 The main temple building rise above all surrounding terrain and is cornered by four smaller stupas, all of them decorated with beautiful reliefs which show Khajiiti of old. Of the four stupas, despite its age, only the northeastern one is in ruins. Once in the interior of the Do'Krin Temple, a short passage leads to the first chamber, which contains the New Moon Altar. To the right, is the Waning Moons Altar chamber and to the left, the Waxing Moons Altar one. Finally, in the other side of the Temple, it lies the Full Moons Altar chamber. Each one of these four rooms have an attached inner chapel. Beyond the Full Moons Altar lies the entrance to the Sanctum. The Do'Krin Sanctum is not the biggest chamber of the Temple, but it is the most magnificent: eighteen lesser senche statues guards the central and bigger one. Between the Sanctum and the New Moon chamber is the most important place of all: the Do'Krin Temple Reliquary, where the Golden Claw is kept safe by the Order. Do'Krin Monastery Objective: Safeguard the Golden Claw at Do'Krin Monastery. The Golden Claw: Ensure the Golden Claw's protection. An Offering: Pray for a Khajiiti soldier on the front lines in Cyrodiil. According to Kauzanabi-jo, Do'Krin means "Warrior's Grin" in Ta'agra, the Khajiiti language. In the quest The Do'Krin Killer in TES Legends, Fighters Guildmaster Ingrid says that a serial killer is murdering monks at the Monastery. This page was last modified on 31 December 2018, at 16:05.